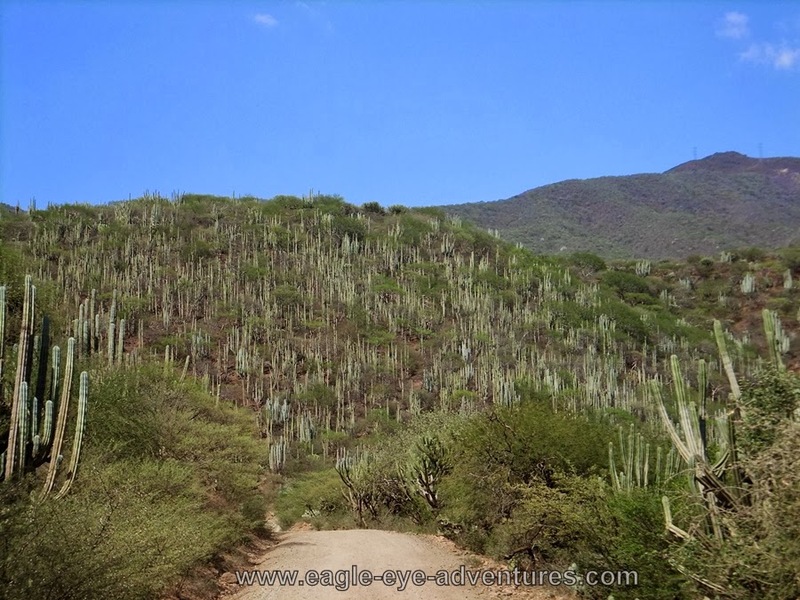 Oftentimes in the desert the difference between the rainy and dry season can be quite stark. 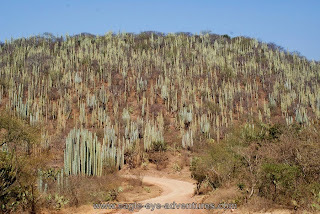 Another example of changes that can be seen between the two seasons—as well as even different times of day—can be seen by this Pachycereus weberi cardonal (a 'forest' of cardons) on this hillside. 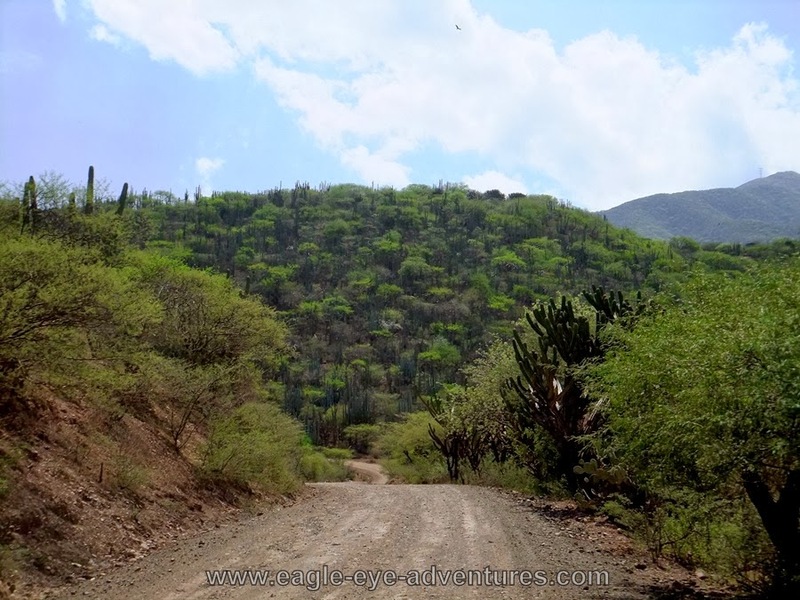 This first picture was taken during the dry season in the afternoon. The hillside is western facing and I was taken aback by the glow of the blue cardons. In the pictures below we can see the difference after the first several weeks of the rainy season. 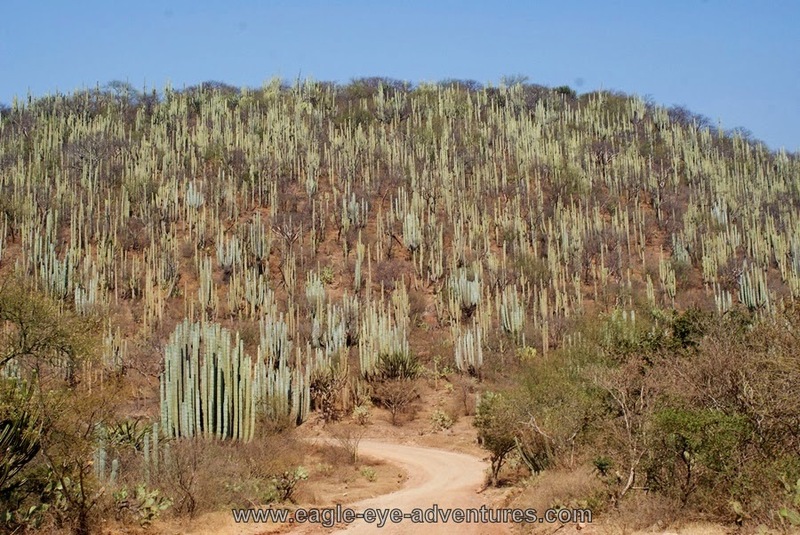 Remembering how great the hillside looked with the cardons (Pachycereus weberi) in the afternoon sun during the dry season, I was surprised to come upon the same hillside a couple of weeks after a hurricane went through to see the scene on the left. Not only were the trees leafing out, but I couldn't even see the cardons! Later that afternoon when driving back out on the same road I was once again amazed. Almost as stark as the difference between the dry and rainy season, it was the different angle of light making an incredible difference on the appearance of the landscape. Clearly it has a great impact on highlighting (or hiding) the plants. When the light was more overhead the soft, newly emerging thorn scrub canopy glows, but when the sun is lower and the light hits the side of the plants, the thick blue cacti once again steal the show!